Racing Schedule – Essential Pressing Info – 2018 Season – Fantasy Speedway – " The way life should be. " 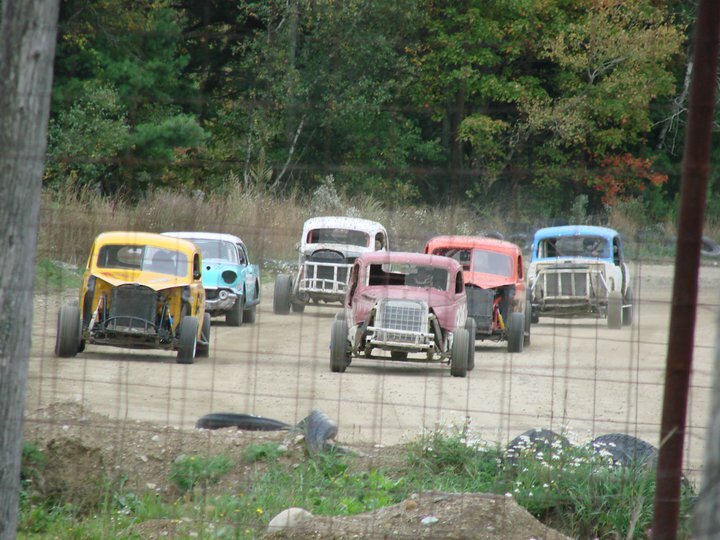 For some fifteen years now, “Fantasy Speedway” folks have pursued the preservation of the earliest era of jalopy/bomber style stock car racing as it was here in the State of Maine. The majority of “vintage” clubs here in the northeast and across the country seem to focus on the more sophisticated and more costly machinery that evolved from these early racers, but our hearts have remained with the old cars that started it all. This early history deserves to be preserved, and we choose to be part of that process. Preserving this history requires significant effort and dedication. Preserving the effort and dedication can only succeed by having fun and enjoyment in the process. 2018 will see Fantasy Speedway continuing its current program of member only family oriented activities. This means that, at this time, we do not plan on presenting any racing operations intended for public attendance or consumption. Attendance at any of the club’s track activities will be restricted to then current (2018) members of Fantasy Speedway Historical Racing Association (SEE NOTE ABOVE). We very much appreciate the support and interest that was demonstrated by our many loyal fans over the three years we were able to offer early era vintage stock car excitement to the general public; and we were further pleased to present that which no other vintage racing organization has undertaken. However, preparing and operating a public oriented race facility with a limited group of volunteers, many of whom were attempting to field vintage race cars of their own, has been no small task. Our club only operation has been found to be much more manageable, particularly for those track workers that have desired the opportunity to enjoy their own race cars. That which had gradually become a chore for too many once again became an enjoyable exercise. This change has allowed each and every owner, driver, crew, family member, and volunteer to enjoy their fun days at Fantasy Speedway. Memberships are available to those having special interest in our older race cars, or the racing times within which they once lived. It is not necessary to have your own early era vintage race car; you only need to love and appreciate them as we do. Check out the Membership page here on our site, and contact us if you would like to be considered for participation in our club activities.